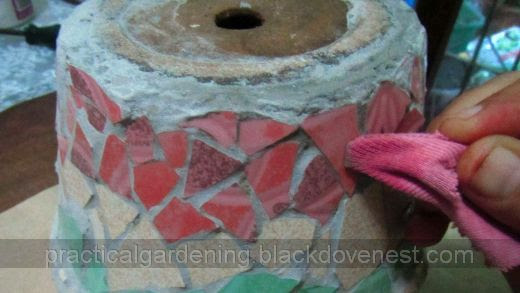 Initially, our son's idea was to use cement or mortar for binding the tiles together to the garden clay pot. This may have been the instruction from the teacher. For this reason, we chose a gray-colored tile grout. Tile grout is cheap and usually comes in 2 kilo bags. Put grout in a plastic container and add a little water. Mix with a piece of stick or spatula. It is better to put just a little water at first and then continue adding a little more if the mix is too thick. When the consistency is similar to that of peanut butter, then the mixture is just right. Follow the instructions in the grout package label. Some tile grout brands require you to wait for 10 minutes after mixing. 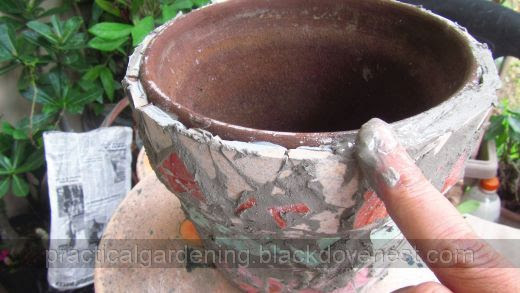 When ready, turn the clay garden pot with its bottom up. Grout is much easier to work on the pot with this position. Smear the grout mixture on all available spaces in between the tiles. Be careful with the sharp edges of the tiles especially when applying grout with your bare fingers. Wear thick rubber gloves if you have to. 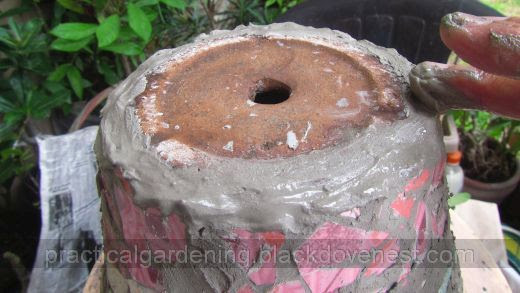 When the garden clay pot's side has been finished, work on the bottom part. Liberally smear grout all around the bottom edge. When finishing, lightly brush the grout with your fingers to achieve an even and smooth surface. Wait for around 30 minutes. This will allow the grout at the bottom of the garden clay pot to dry a little. Then turn the pot into its upright position. 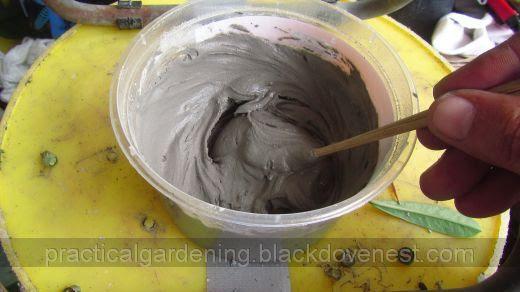 Just as you did with the bottom edge of the garden clay pot, apply a liberal amount of grout on the rim of the pot. 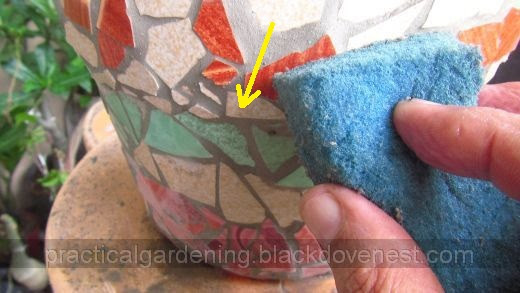 Lightly brush the surface of the grout with your finger to achieve a smooth even surface all around the pot's rim as shown below. 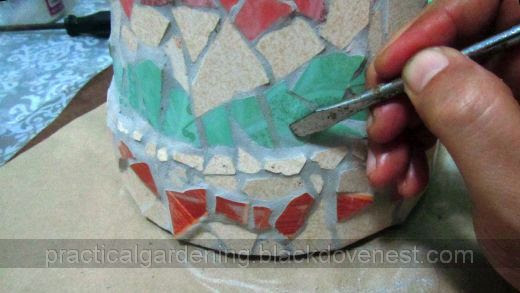 Now is the time to work on excess grout on the garden clay pot sides. You will notice the grout to have formed a haze on the tiles. Slide a wet (almost soaking) sponge on the grouted tiles. Brush the sponge lightly across the tiles downward in a diagonal manner as shown below. Some of the excess grout may slide down but most of the excess grout would be absorbed by the wet sponge. 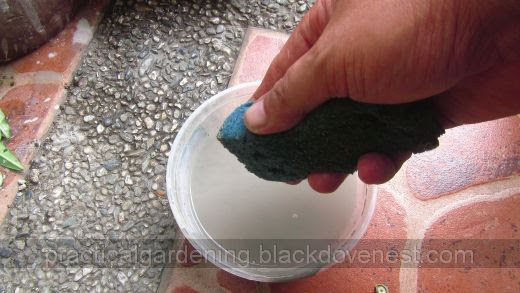 Squeeze the water out of the sponge into a plastic container. Much of the absorbed fine grout will settle at the bottom of the plastic container. Continue the manner of brushing the soaked sponge lightly all around the tiles until all visible excess grout is removed. When finished, let the grout dry and harden overnight. On the next day, remove any hardened grout on the tiles with a flat screwdriver. Notice how the grout surrounding the broken tiles is now nice and smooth. If there is any leftover grout haze on the surface of the broken tiles, you may wipe these off with a wet rag. You could wrap the wet rag on the flat screwdriver and work precisely on the surface of the broken tiles. 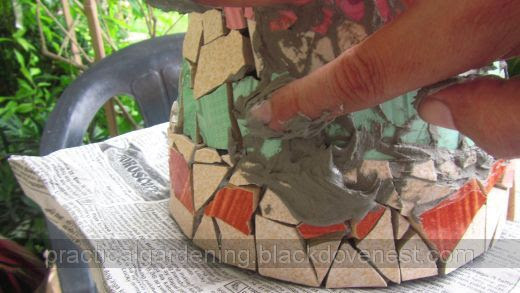 When the surface of the broken tiles is clean, let the finished garden clay pot dry out in the sun. 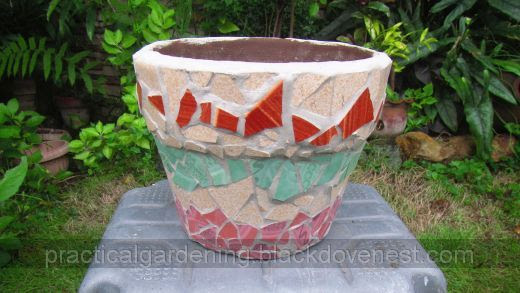 This is essentially the finished mosaic flower garden pot.